Late last year, SWREG, the e-commerce provider that has been powering the Just Great Software ordering pages announced with quite a bit of fanfare they’d be lowering their rates to $1 + 2.9% per transaction. That is significantly lower than all of their direct competitors’ rates, including the ones owned by Digital River (as is SWREG). Of course, there had to be a catch with such low rates. The new low rates require acceptance of a new contract that allows SWREG to market various offers to people purchasing software via SWREG. Simply put: they want to sell more stuff to your customers if you’re on the 2.9% plan in return for the low rates. There’s nothing wrong in principle with such a deal. However, I do not want to position Just Great Software as a brand where people end up spending more than they originally intended. So, like many others, I opted not to sign the contract and to keep the orginal higher rates. Just Great Software enjoys a grandfathered $1 + 4% rate, which is still very competitive. SWREG still signs up new clients at $1 + 6% on a contract without the extra marketing requirements. So I figured all was well. Last month, SWREG finally got around to implementing these add-on sales. It appears on the order confirmation page, which confirms the software was purchased and the order is complete. Close your browser and go to bed. Can you spot the sales offer? If you’re wondering why the Just Great Software ordering pages look totally different–I’ll get to that. Our customers won’t see any of this. 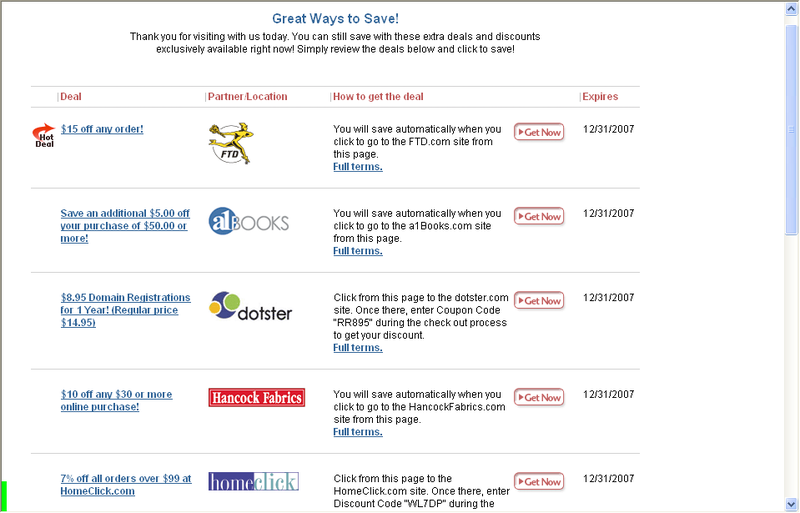 The screen shots show Joe Mercier’s dpopup.com ordering pages, kindly provided by Sue Pichotta of icons-icons.com. The offer is only shown to US and Canadian customers. The sales offer is indeed the big “Continue” button with some fine print above it. While this technically looks like a sales offer, most people don’t read carefully, and only see the Continue button. Everybody wants their software yesterday. This isn’t pizza. Delivery in 15 minutes doesn’t cut it any more. I speak from experience. So the reflex is to click the Continue button, and the unsuspecting customer has agreed to be pitched some kind of offer. Scrolling down the page, there’s a big Yes button, and a small “No thanks” link. Clicking the big Yes button is all it takes to get some subscription billed monthly to the credit card you just used to make your software purchase. No need to enter the card number again. If you click the “no thanks” link, you get more sales offers. I have no problems with an e-commerce provider politely pitching useful offers after completing a sale, such as offers for software from other clients that can be used in combination with ours. 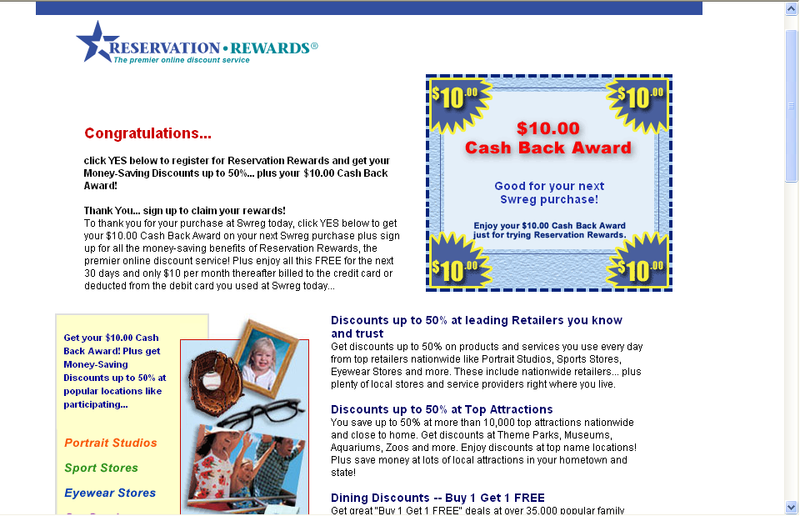 But instead, SWREG is using smoke-and-mirrors to trick people into signing up for a subscription of dubious value. Frankly, I can’t see why any software publishers would put something like that on their order form to save 3.1% on their e-commerce rates. Most people don’t realize that the company behind the order process is not the company that publishes the software. They’ll think the offer comes from the software publisher. Word-of-mouth is a major source of promotion (read: income) for many small software companies. Don’t kill it with sleazy offers to pinch pennies. Positive word of mouth spreads much faster than 3.1%. You don’t want to even think about negative word of mouth. I definitely recommend all software developers to stay away from the $1 + 2.9% plan. The standard $1 + 6% is plenty competitive given the support and features you get. No complaints from me there. If you want rock bottom rates, and don’t mind to put in some extra work to integrate the sales process into your web site, there’s always PayPal or your own merchant account. The real problem with this episode is that SWREG had the luminous idea of also putting the offer on the order pages of customers that did not accept the new contract. Sure, the old contract does not forbid SWREG from doing this. However, since SWREG’s clients clearly had a choice between a contract with add-on sales requirements, and one without such requirements, any good lawyer can argue that the contract that says nothing about add-on sales implies that there will be no add-on sales. Otherwise, there’s no difference between the contracts, and no point in paying a higher rate. This is breach of contract. Not to mention trust. Unfortunately, paying a higher rate may not be a long-term solution. It will depend on the quantity and style of the stuff SWREG is going to pitch, and how many of their clients ignore my advice and stay on the $1 + 2.9% plan. The thing is that the $1 + 6% ordering pages look exactly the same, except for the last page. If people start to recognize SWREG’s ordering pages as the kind where you get suckered into buying stuff you don’t want, that could significantly increase shopping cart abandonment. So why aren’t the Just Great Software ordering pages affected by this? What makes SWREG unique among e-commerce providers is a feature they call “advanced level”. Simply put, this system allows the software publisher to create their own ordering pages on their own server, calling out to SWREG’s server in the background. That’s what we do. 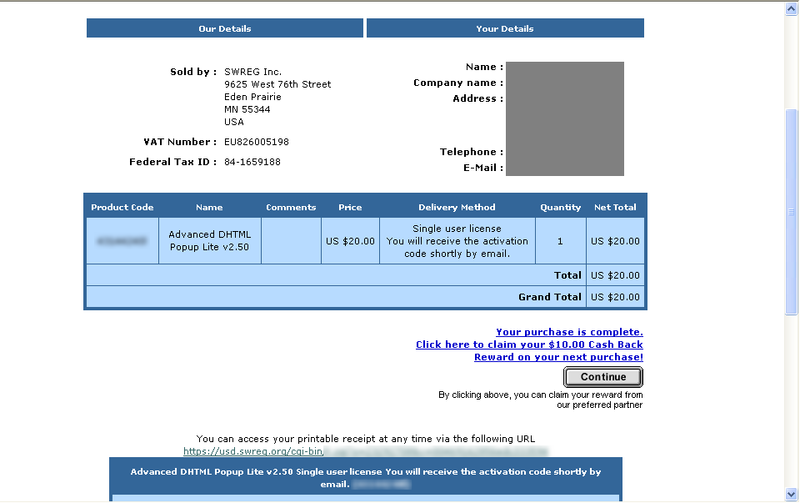 When you buy from us, your browser never leaves the jgsoft.com domain, but your credit card is still charged by SWREG. The only other company that offers such a system without needing your own merchant account is PayPal, but in the US and the UK only. Since the order pages are on our own server, we have full control over them. Nobody can insert anything in any way. (Note that if you’re on the $1 + 2.9% plan, the contract does require you to add the marketing stuff by yourself. If you don’t, I suppose they’ll bump you up to the higher rates.) We’ve never had any serious problems with SWREG’s services, and support is generally quite prompt. It has the features we need, so I’m happy to continue using them and even recommend them, but only for their unique “advanced level” feature. So why don’t I apply for a merchant account? Well, I really don’t want to walk into a bank and say “credit card”, “real time”, “internet” and “multiple currencies” in one sentence. The poor girl behind the counter would have a heart attack. In fact, she didn’t even know that her bank issues credit cards to corporations. You know, your garden variety corporate Visa. Two whole bank branches argued against it until they called the head office. Pieces of eight, anyone? My name is Brant Pallazza. I am the Vice President of Shareware at Digital River. I wanted to thank you for the honest post that you made regarding the offers being presented on confirmation pages. We do listen to our clients and we do our relationships VERY seriously. I would first like to state that we are not trying to use “smoke and mirrors” and we are not trying “trick people into signing up for a subscription of dubious value”. In choosing partners, we selected only those used by other reputable online marketers (i.e. Amazon, Barnes & Nobel, etc.) that have a history of customer care and satisfaction. We have also selected partners that have created products and programs that online consumers find of value. The permission to present these offers was granted to SWReg in the new 2.9% contract. In return, we negotiate offers with third parties that generate the greatest return to our publishers. Which is why I would like to point out that we share any revenues that result from these promotions with the client whose post purchase page generated the revenue. As a result, the effective ecommerce rate paid by SWReg clients is actually lower than 2.9% plus $1 when these additional incremental revenues are accounted for. I will admit that in launching the program, it was our mistake that the post purchase offer was inadvertently launched on all client confirmations. This was taken down immediately after it was brought to our attention. It was supposed to launch ONLY on those clients sites who agreed to post purchase promotions in the SWReg 2.9% contract. You have my sincerest apology for the error. Jan, it has never been our intention to mislead or miscommunicate with our clients or customers in any way. I apologize for any confusion or inconvenience. And I speak for the whole SWReg staff when I say that we appreciate your honesty and sincerity. If there is any further clarification that I can provide, please do not hesitate to contact me. Thank you for your response and apology, Brant. I have met and talked with Brant several times at shareware industry events. I perceive him as somebody who is intelligent and genuinely interested in the needs of Digital River’s clients. “VP of Shareware” means that he oversees the long list of e-commerce providers catering to shareware authors that Digital River has acquired through the years, which includes SWREG. I indeed failed to mention that if a customer signs up for one of the special offers after purchasing software from an SWREG client, SWREG will split the revenue between themselves and the client (i.e. the shareware author). I don’t know exactly how much is shared, as our own (advanced level) ordering pages don’t show any offers, so we don’t get any extra revenue. 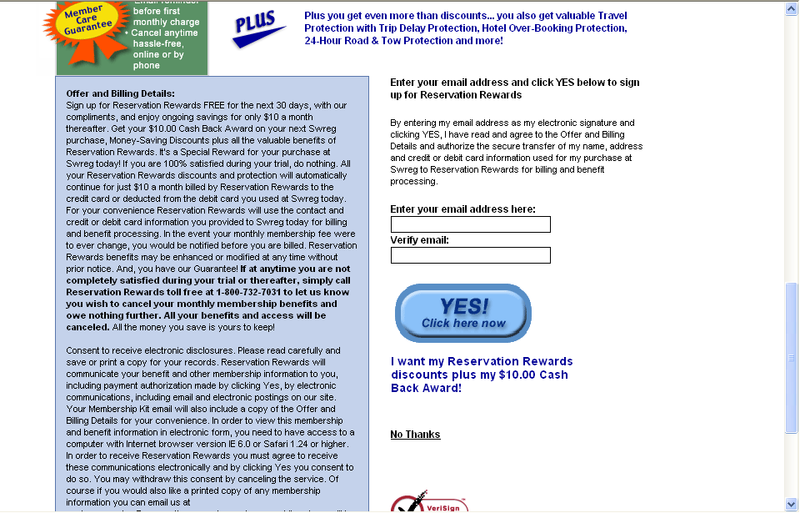 However, I stand behind my opinion that this particular offer (“Reservation Awards”), and most importantly the way it is represented as a “Continue” button, will destroy customer goodwill, and is not worth the lower rates and the bit of extra revenue. The number of technically minded people among software buyers (certainly those buying Just Great Software) is far higher than that among the general population. And technically minded people are easily annoyed when they feel they’re being sold on something. Until SWREG changes their offers to be very clearly marked as extra purchases, and of actual interest to software buyers (like: more software), I really can’t recommend the $1 + 2.9% plan. I’m still happy with SWREG’s “advanced level” system, and I do recommend it to those who have the sales volume to spend a few days to integrate their ordering system into their website. In my eyes, and (I believe) in the eyes of many customers, an integrated order form looks far more professional than being handed off to a 3rd party site, even though I know very well that the 3rd party e-commerce providers generally do a good job. Thanks for the post. I was surprised to know that someone from DR’s higher management listens to us! So, that was great news. I have a question regarding advanced level … I was considering implementing it a long while ago, but was afraid of one thing: Wouldn’t a potential buyer be more relieved to know that a third party (a large and professional payment processor) is managing his purchase, rather than a small software shop that might lack enough precautions and security policies regarding the storage of CC numbers, … etc? Two things that I can hardly be sure of when I see a payment page that comes from a small software author’s site that I never dealt with before. What do you think about that? Am I too doubtful? Couldn’t I safely say that 40 or 50% of software buyers think like me?